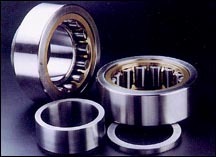 LYC is the biggest comprehensive bearing manufacturer in China. Its product covers 6000 sizes, 9 categories in all precision tolerance classes and its yearly output volume is 70 million pieces. 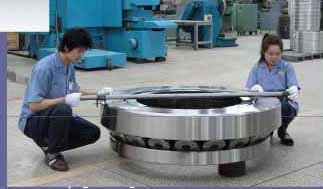 The product's minimum inside diameter is 10 mm and maximum outside diameter is 5.49 m. The lightest bearing weighs only 25.4 grams and the heaviest one weighs 15 tons. LYC has developed many kinds of the bearings for the spindle of precision machine tools in different tolerance classes, ranging primary from the NN3000K and NNV4900K double-row cylinder roller bearing; 3000, 3000 and 35000, 35000R single and double-row adapter bearing, B7000C bearing for spindle of the high-speed motor, to double-united, multi-united double-row thrust angular contact pedestal bearing. Among these bearings, B3-706 and B3-707 single-row adapter bearing for the spindle of precision coordinate boring machine have been rewarded with gold medal from state. 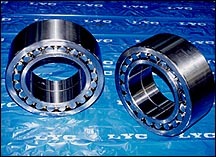 They have filled in the gaps in the fields of science and technology in China and attained the advanced world level of the same kinds of foreign products; The C946122JY three-row thrust angular contact pedestal ball bearing has received the technology advancement second-class prize from the Ministry of Machine Building. The bearings for the regular speed passenger train have been appraised to be the state high-class product. As for the bearings for the quasi-high speed passenger car developed and produced by LYC, all of its performances have met the technical requirements of the Ministry of Railway, and its temperature-rise in service is equivalent to that of NSK bearing. 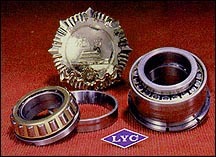 The bearing for the quasi-high speed passenger car developed and produced by LYC can sustain the speed of 160-200 km/hour. Its life lasts 3.5-4 million kilometers, and the reliability of its life at 800 thousand kilometer can be more than 99%, attaining the advanced world level of the same kinds of products. The quasi-high speed railway bearing has been approved as "Nationnal Major New Product" by State Economy And Trade Committee. It won the honor of the "new high-technology product" from Henan Provincial government. LYC is the designated manufacturer of railway freight cars. The 350626SC (previously 197726) bearing produced by LYC has been awarded Gold Elephant Prize, the top honor in Henan Province. LYC devotes itself to researching and developing bearings for automobile. The corporation has successfully developed the bearing for the car hubs and gearbox, the bearing for automobile's transmission shaft and redirector, bearing for motorcycle's engine. LYC produces bearings for limousine's wheel-hub and gear-box such as LM11749/11, L45449/10, LM11949/10, KLM300849/11, LM60349/10 etc. ; bearings for automobile's transmission shaft and redirector 3-013, 66/22E-Z,66/19E, 16003E. And bearings of 6001E/P9Z2, 6006E/P6Z2, 63/28/P5Z2C3, 6301E-RS, 6200E-Z, 6204EP6Z1, 6204E/P63Z2 are made as accessories for Shanghai Volkswagen, FAW Volkswagen, Tianjin Xiali, Jinan Qinqi, Hainan Sundiro and other main engine factories. The products are exported to Europe, America and Southeast Asia. LYC has been designated as A-class supplier by Shanghai Volkswagen, FAW Volkswagen and etc. key consumers. 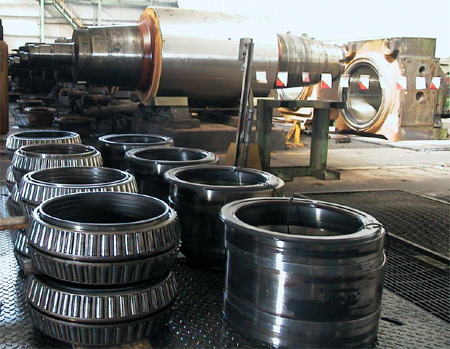 For over 40 years, LYC has developed more than 300 types of bearings for rolling mills. Among these, bearings for Model 1700 rolling mills imported by Wuhan Steelworks and Shanghai Baoshan Steelworks have attained the advanced world levels, achieved the same level of similar products made in Germany and Japan. The four-row adapter bearing, developed and used in the supporting roller of the surface-finish machine for Panzhihua Steelworks, has embodied the world's general developing trend of the bearings for rolling mills. This bearing also brings in foreign exchange by exporting to foreign markets. The bearings as accessories for the No. 4 machine that LYC developed for the previous Second Ministry of Machine Building, was awarded a joint prize from the previous first and second Ministries of Mechanical Building. The bearing as accessories for ZGM-95 coal grinder machine filled in the gab in the fields of science and technology of China. LYC has successfully made the necessary accessories for the gates of the Longyangxia and the Xiaolangdi water conservancy hinge works. Of the products for these two water control projects, which the bearings are adopted with the spaecial design and special treatment in process. 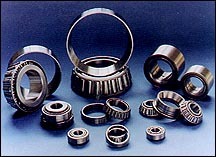 Foreign contractors, after careful testing and examination, considered the bearings to have achieved SKF level. 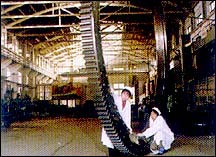 LYC is capable to design and produce any kinds of slewing bearings sized over than 6000 mm, especially the various kinds of the no-gear, internal gear and external gear four-point-contact ball bearings in any tolerance classes, the double-row thrust angular contact trust ball bearings, the three-row composed cylinderical roller bearings, the cross cylinderical roller bearings and the other series of slewing bearings etc. They are widely used in the fields of ports, metallurgy, mine, food, coal, cement, wind-power generation, engineering mechanism and etc. At present, the extra large slewing bearings with the biggest dimension, heaviest weight, highest precision in China are all produced by LYC. The dozens of slewing bearings have been awarded the technology prizes from State, Province and Ministries.